Weather Overcast throughout the day and breezy starting this afternoon, continuing until this evening. The Danvers River begins on the west side of Beverly Channel at the state Route 22 fixed bridge. 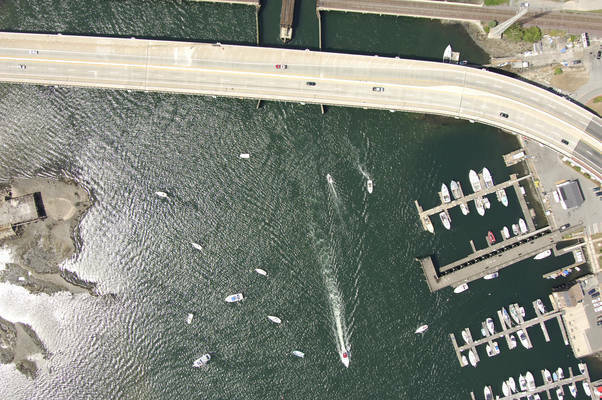 The Beverly area has an active and vibrant boating community, and there are five marinas along the Beverly waterfront. Of these five, two accept transient guests (or have moorings available), and two pump both gas and diesel fuel. Ashore are a variety of shops, markets and other stores for provisioning. Beverly, like Marblehead and Newport, has an extensive mooring and anchorage area that extends almost three miles out to Coney Island Rock. 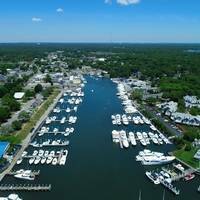 The Jubilee Yacht Club maintains a large portion of the field, but there are other areas that are designated anchorages. Always be sure to anchor outside the entrance channel (a neat and tidy border of boats can be seen just outside both sides of the entrance channel in the image above). 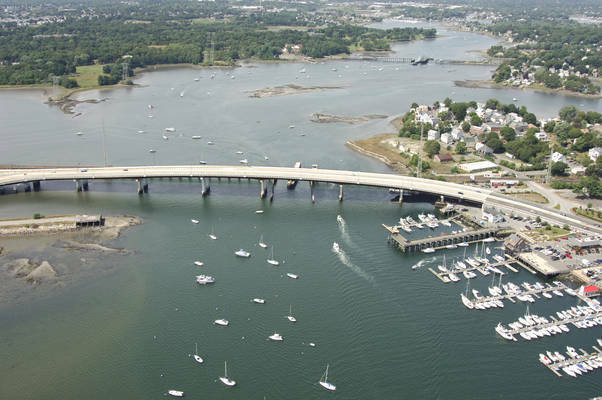 The image above is a view from the west looking east over the state Route 22 bridge (49-foot fixed vertical clearance) and North River Railroad Swing Bridges (three-foot closed vertical clearance; usually left open) at the town of Beverly, which is located off to the left-hand (north) portion of the image. Off in the upper-right-hand corner of the image is Salem Neck, while the town of Salem is located off the picture to the right (south). Beverlys five marinas are seen neatly stacked along the Beverly waterfront, with extensive mooring and anchorage fields working their way out to the east. 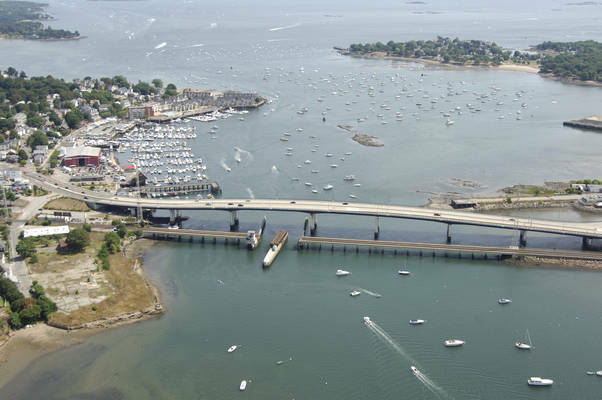 The approach to Beverly Harbor and the Danvers River begins about five miles east of town north of Bakers Island and south of Great Misery Island. If you are arriving from offshore, the Bakers Island Light (111 feet above water, flashing white every 20 seconds) is a good landmark and aid to navigation into the area. Once you have sighted both Bakers and Great Misery Islands, set a course to intercept flashing green buoy 9 just north of Bakers Island. If you can spot it, the Hospital Point Range is available and is located on a course of about 292 degrees magnetic from flashing green buoy 9. After you have cleared flashing green buoy 9 and set a course to the west-northwest, you will follow flashing red 10 (south of Little Misery Island), flashing green buoy 11, and then flashing red buoy 12 (at Johns Ledge). Past flashing red 12, a course of 290 degrees magnetic for about a mile will put you between flashing green buoy 13 and red nun buoy 14. From here, the channel bends south and runs past flashing green buoy 15, and then to flashing red buoy 16, where you will make a turn to the north-northwest to enter the Beverly Channel, which begins at red nun buoy 2. From here, the channel twists in and around the shoals and rocks with depths of about 19 to 24 feet. Anchored boaters are generally good about staying out of the channel, but keep a close eye out if you are arriving at night. No reviews yet! Be the first to write a review of Beverly Harbor / Danvers River Inlet.